One of the revisions of the fat PlayStation 2 was the V3. They were found in many of the earliest SCPH-3000x systems. Matching console model numbers and board numbers are listed below. You can find the model number on the sticker on the bottom of the console, and the board number is printed on the PS2 main board if you take apart your console. Note that there can be multiple board numbers within a specific model number. 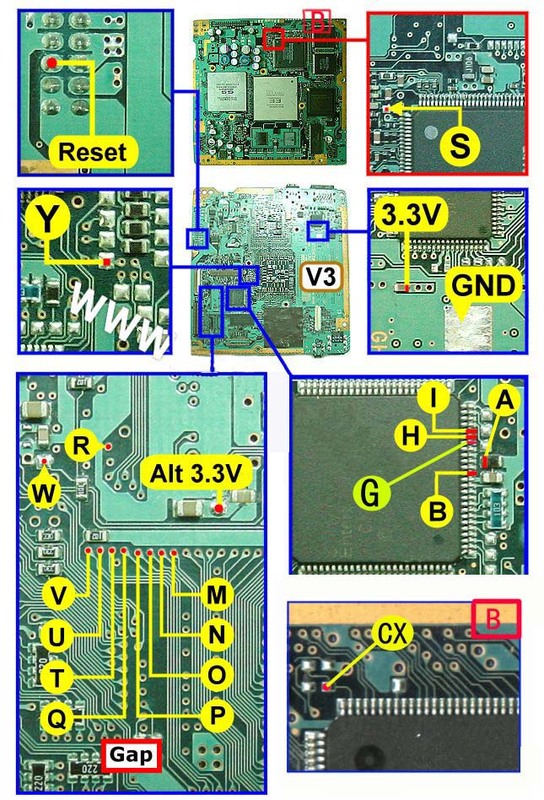 Note that there are multiple versions of the Modbo modchips available, but the installation diagrams are all the same. Some example versions are Modbo 3.0, Modbo 4.0, Modbo 5.0, and Modbo 750. The V3 board revision may not be compatible with the newer Modbo 4.0/5.0/750 chips being sold today. 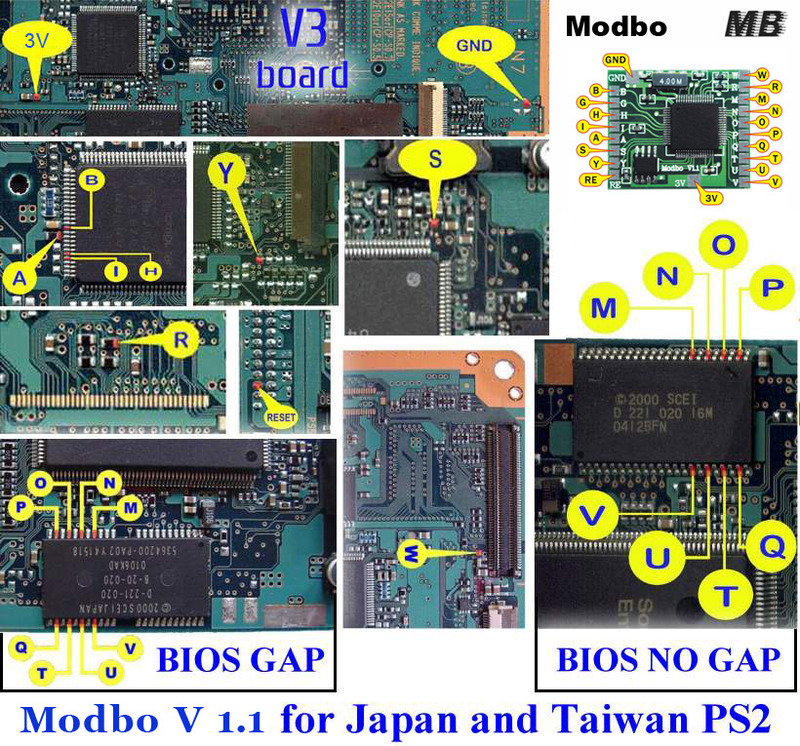 For more information about Modbo modchips click here, for more information about PS2 modchips in general click here. Some V3 consoles have a gap in the middle of the pins of the BIOS chip (near pins P, O, N, M, Q, T, U, and V). Use the BIOS GAP part of the diagram for those systems. If there isn’t a gap in the pins then use the BIOS NO GAP part of the diagram. The diagram below says it’s for a Japanese system. The same diagram works for American and PAL systems if the H pin is not connected. 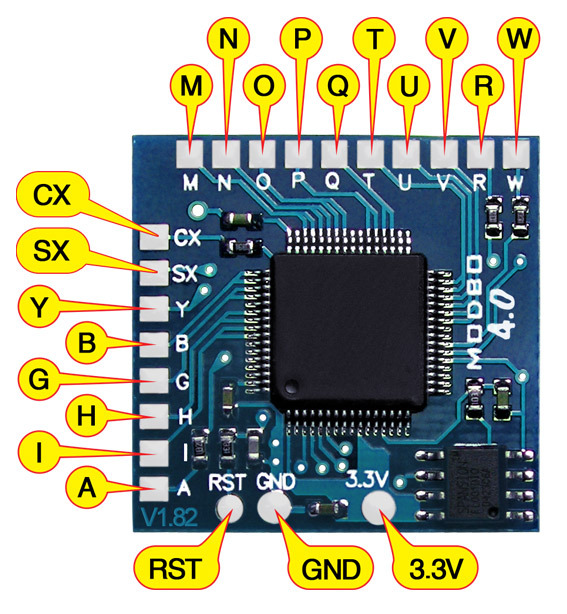 Below is another diagram that is for the V3 board. Here are some tips I have for you when you are soldering your chip into a V3. Using 30 AWG solid core wire works well for most of the points. Use some thicker wire for the 5V and ground wires.